Katharine Hepburn and Cary Grant are two of the most iconic and influential actors in cinema history. Their names appear on almost every “Greatest” list and so do their films. We’re lucky as an audience that we get to witness the two sharing the screen in FOUR FILMS! Four great films in their own right, I might add. Their efforts together are Sylvia Scarlett, Bringing Up Baby, Holiday, and The Philadelphia Story. All of them were made very early in their careers before Kate partnered up with Spencer Tracy and Grant broke from screwball comedies to more complex characters in Hitchcock films. What other actor could get away with doing this to Katharine Hepburn? What I love about the Hepburn and Grant films is you can see how the two became better actors because of each other. Their first pairing, Sylvia Scarlett, is known as one of the most unsuccessful films of the 1930’s but is also the first time Grant’s versatility was showcased. Before this film, he was reduced to vapid leading men roles that didn’t require anything more than his good looks. It was actually Hepburn who suggested Grant for the part. Bringing Up Baby was Hepburn’s first foray into comedy. Grant and director Howard Hawks were instrumental in helping her learn her comedic timing and the results paid off; it’s now regarded as one of the best comedies ever made. “We got on well, Cary and I. It was fun to play with him, and I think he had a good time too. 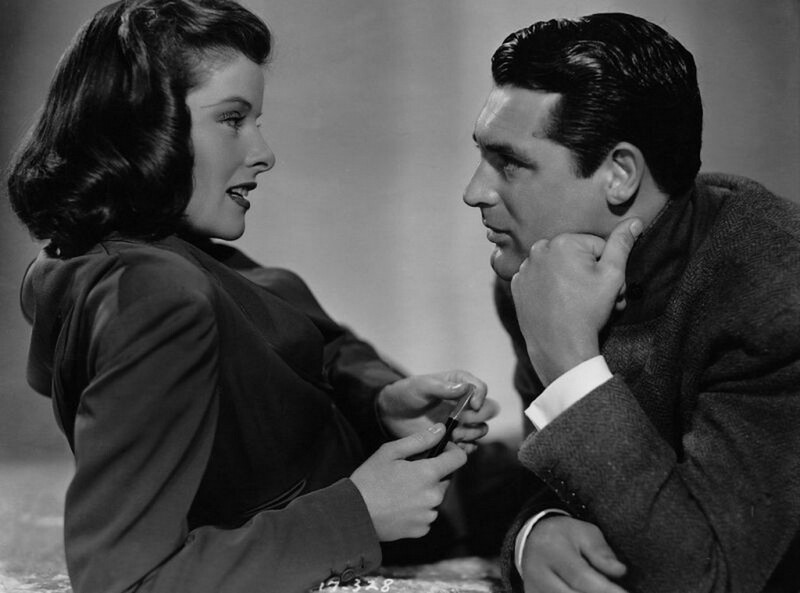 People liked us together, so we enjoyed it,” – Katharine Hepburn on Cary Grant. 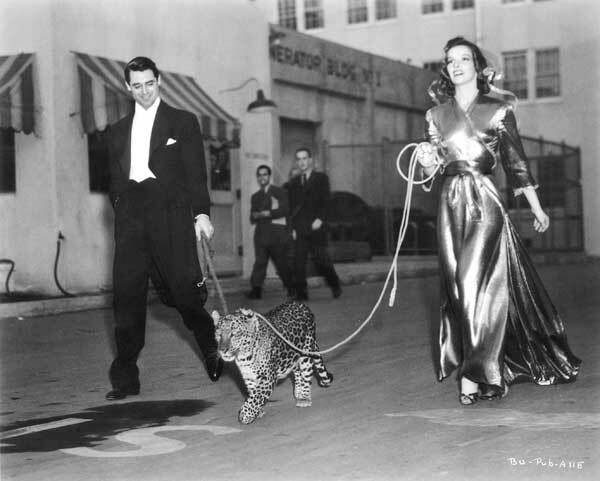 Cary Grant and Katharine Hepburn with Nissa, the leopard, on the set of Bringing Up Baby. My favorite Hepburn and Grant film is Holiday (1938, Dir. George Cukor). Unlike most romantic comedies, Holiday features complex characters backed by a screenplay dealing with social class and what’s more important in life: making a living or following your dreams. It’s an important social commentary on society and Hepburn and Grant are delightful in their respective roles. Grant is Johnny Case, a businessman who plans to pay his dues in a job he doesn’t care for very much in order to make enough money to afford a holiday. Johnny is a free spirit, he comes from a poor background but has a thirst to make something of himself in the world. His carefree glee is shown with impressive acrobatic stunts taken from Grant’s own background as an acrobatic performer. These little moments happen throughout the film. He falls in love with Julia in the beginning of the story and two weeks later he meets her family to tell them they are engaged only to find out she’s rich and later, he and the audience discover she’s also a horrible person focused on her place in society. Her kid sister Linda (Hepburn) turns out to be Johnny’s kindred spirit. There’s a scene between Linda and Johnny in a playroom that is heartbreaking and beautiful. Linda confides in him about how she doesn’t fit in with the society crowd and how her father doesn’t understand her worldview. She’s holding a giraffe and we see her playfulness which she often hides under the facade of a wealthy heiress. Linda is the blacksheep of the family but in the playroom with Johnny and surrounded by children’s toys, she feels like this is her place where she can finally be herself. But remember, Johnny is engaged to her sister so most of the film she’s in the back hiding her budding attraction. Watching this film, you get the sense that you’re not really watching any acting involved because Grant and Hepburn’s performances appear natural. They go display comedy, drama, romance, and it all seems effortless. When the two first meet and later the scene in playroom, you see a mutual respect and a spark develops. It turns into a deeper attraction but unlike most films when the two male leads meet, bicker and then get married by the end, you see Johnny and Linda’s feelings become stronger as the two discover they are soulmates because they see the world with the same attitude of “life is what you make of it.” The chemistry is believable because in real life Hepburn and Grant had a deep respect for each other and a friendship that lasted well after their collaborations ended. I love Hepburn and Grant’s films. All three are classified as comedies on the surface but they are all different types of comedy. Each of them have something different to offer and I like that they both were game for anything whether it be chasing a leopard or Hepburn dressing up as a boy. These four are staples in both of their careers and when you look at both Hepburn and Grant’s body of work these films show that their best work was yet to come for both. This post was a contribution to The Great Katharine Hepburn Blogathon hosted by Margaret Perry. I love Holiday too. Those scenes with the two of them are such a joy! They are so sweet and I love how we got to see Cary Grant’s acrobatic skills. Holiday is my fave, too, of the Grant/Hepburn films. I like how you described them as “natural” – sometimes performances from this period can seem very stylized, but they certainly aren’t. It makes the film feel fresh, even today. I love Kate and Cary together! Sylvia Scarlett is a delightful film, with a balance of drama (when Kate’s father dies) and comedy. Yet, Holiday is the only of the pair I haven’t watched. Thank you so much! I hope you get the chance to see Holiday soon, it’s definitely a treat. And that gif from bringing up baby where he pushes her down! I am saving that..
“When you hear the tone the time will be 7:37 and a quarter.” Love both films too. Thanks for your comment! Can’t wait to read your post. weren’t they wonderful together? I think “The Philadelphia Story” is my favorite – mainly because Kate played it straight. She and Cary were delightful but mature. Great post about 2 of the best. The Philadelphia Story is so great. What a cast! Three of the greatest actors in Hollywood history all in one film? Amazing! I love Cary in the film, he’s very understated and it works perfectly. I love the scene where Jimmy Stewart burps (which wasn’t scripted) yet they just went on. It’s a very brief moment where Cary almost breaks character and you see a glimpse of him as “Cary Grant – the professional actor,” great moment. Thank you for your kind words, Michaela! I’m still relatively new at blogging. This community is so welcoming! I have learned so much from everyone’s takes on classic films.